Of all the human senses sight is perhaps the most precious of them all. For those blessed with perfect vision or 20/20 vision as it is sometimes known, it is often taken for granted. For many people with poor vision they are able to improve their sight with the use of spectacles or contact lens, and for a growing number there is now laser correction treatment, though this does come at a very high price! All these visual aids help us obtain clarity of vision which otherwise we may not enjoy. I have recently undergone cataract surgery, which has I am delighted to say given me vastly improved sight. I have been very short sighted since a teenager and have worn glasses or contact lenses for the past thirty years. Over the last year or so I had noticed that my vision, even with glasses was not as it should be and that despite an even stronger prescription I was still not seeing as clear as I knew I should. The experience of having my cataracts treated has been quite a powerful one for me. After thirty years of relying on spectacles or contact lenses the replacement lens used in my cataract operation has given me what I can only describe as a wonderful clarity of vision such as I have not experienced in many years. From the moment I removed the patches from my eye’s the following the operations I could see with such clarity that it was only then that I realised just how much I had been missing. Obviously my vision is not perfect, my distance vision is wonderful, the near site is a little blurred close up so I require spectacles for reading, but to be able to see the shape of a leaf on a tree or the blades of grass and not just a green mass is a wonderful experience for me and I now release just how my vision had progressively deteriorated over the past few years and without me really noticing until very recently. All this clarity of vision got me thinking about our sight and what we see. The nurse at the hospital had said that after the operation my vision would be “a bit of revelation” and it certainly has been. She also said that “now you’ll be able to see all the dirt and what needs decorating!” that is also true, though not the bit about dirt I hasten to add. These words sounded familiar and struck a chord with me. We often talk in Odinism about the Re-Awakening, being woken, restored or the lifting of a fog! All of these allude to suddenly being able to see with greater clarity, opening our eyes and seeing more than we have before. Vision restored! When I actually first discovered Odinism it was a revelation in many ways for me. I already had a very strong sense of the folk and it was those folk callings that led me on a path of one discovery after another. Each step along the path revealing yet another revelation and as I took each step so the metaphorical fog began to lift and things around me became clearer and clearer. Each day was like putting on new slightly stronger spectacles and each day being able to see the world around me just a little more clearly. Just as my new found vision revealed new beauty it also revealed a great deal of dirt, decay, corruption, distortion and dishonesty. At first I was not sure I really wanted quite that level of clarity, quite that level of vision, it was pretty depressing seeing the world in ALL its true colours, seeing things how they really are, “warts and all” as the old saying goes. Each new step seems to reveal yet more truth to me and often that truth is disturbing, yet we cannot have or seek greater clarity without being prepared to see everything for what it is, “warts and all”, no matter how painful that maybe at times. One of my favourite passages from the Book of Blotar is from the Oath of Profession and I quote it here. You are now ready to take your oaths and declare before all that you are restored to Odin’s Holy Nation. The Odinist path is not easy, for with true restoration, comes a greater depth of vision. More clearly will you see, more keenly feel. That which is ugly will seem uglier, that which is harmful to our folk and lands will seem yet more harmful. Greater vision, greater knowing brings sorrow. Yet it also brings joy, that which is beautiful will be seen as yet more beautiful, that which is good for our folk and lands will warm you and please you more. Knowing these things, will you continue? This short but powerful passage says so much to me that is true about being restored to our true organic path, our true ancestral religion and to Odin’s Holy Nation. With the restoration of vision so comes clarity and as it says above, “Greater vision, greater knowing brings sorrow” and it is this sorrow that so many of our folk cannot cope with. So few people really want true 20/20 vision, they do not want to be restored, it is easier to face the world when you do not have to see the decay, the dishonesty and the dirt. The world appears easier when you see it through rose tinted glasses, through vision where only the good is seen, no decay, no dishonesty or distortion, no dirt! But living in Utopia, a world where ugliness in all its forms is filtered out does not mean it is not there, merely that it is not seen by those that do not wish to see it. It is a classic case of the “Emperors new clothes”! It is in many cases a self inflicted delusion of well-being! If I cannot see all the decay, dishonesty and distortions therefore it cannot possibly be there and I do not have to face it! I do not have to face it and tackle it! This is a great weakness, this self inflicted blindness within our folk means they are stumbling along life’s path being lead by the perverse, and it is taking them into very dangerous waters. Our folk are blindly following the dishonest, decayed and distorted into near certain extinction. As the masses of blind follow the perverse there are some within our folk that have seen through the fog of deception, they have seen the light shining out, the Odinic beacon showing the way home, home to Odinism and to true restoration. 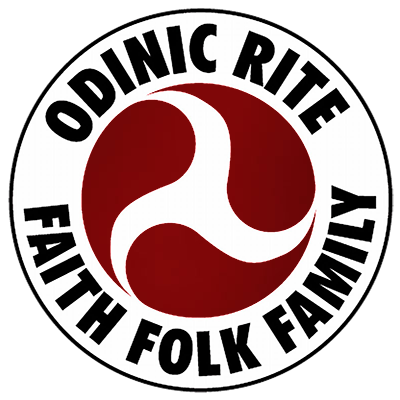 Within the ranks of the Odinic Rite there are those that have freely chosen to take the Oath of Profession and have chosen to be restored, Professed into Odin’s Holy Nation, a path that takes us further along the road to greater clarity of vision, just as the passage from the Oath of Profession tells us. Yet merely speaking the words of the Oath of Profession does not bring automatic restoration or clarity of vision, it is not a magical verse that when the words are spoken the clouds above will split asunder and the Sun burst through! There is no guarantee that all those that take the Oath will be restored, some find the greater vision and knowing that comes from taking this very serious step too hard to fulfil, too hard to accept and prefer the easier world of selective myopia. Others, just as in some sections of society, prefer the comfort of distorted vision, living in a world of delusion because it is more comfortable. Or simply that they are unable to shed the veil of delusion that the alien creed has cast over our folk. True restoration, true clarity of vision and greater knowing along with the downsides and the good can only really be experienced if we are prepared to undergo the corrective surgery that is truly required. We must be prepared to embrace Odinism and to allow it to shape every atom of our being, every thought, every action. We cannot be selective or choosy, it is all or nothing. Odinism is not a hobby or part time interest which can be picked up and dropped as the mood takes. It is not just a part of life, it is LIFE itself! If we as Odinists are to ever gain complete and perfect clarity of vision and knowing, the Odin Consciousness, then we must embrace the whole of life, not just the parts that make us feel warm and cosy. We must be prepared to face the bad as well as the good, the ugly as well as the beautiful. Only with courage and true conviction can we ever hope to lift the fog of delusion which has enveloped our folk since the coming of the alien creeds teachings. Wyrd willing and thanks to modern medical techniques I will enjoy my improved eye sight for many years to come. I shall however only obtain perfect vision once I have obtained the Odin Consciousness. I do not know when that maybe or if I will reach it in this or another life time. I just know that as I walk the path of Odinism and embrace life, “warts and all”, my vision becomes just a little clearer each day. I sincerely hope that the chronic selective myopia that affects our folk in such numbers can be cured by restoring our holy religion and bring about the re-awakening of our folk. Then and only then, can our folk truly experience 20/20 vision.